A student pub and yet the real ale selection pleased a grizzled oldie like me too. The barman is a Leeds United devotee, proudly displaying an item of the Yorkshire club's leisurewear and local events are proudly advertised on the pub walls. Not out of the ordinary but an important staging post on any Bangor pub crawl. 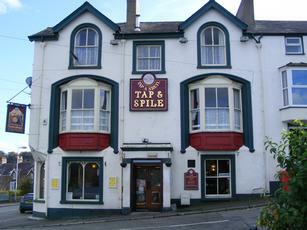 This pub had possibly Bangor's best real ale selection and enjoys a fine location overlooking Bangor Pier and the Menai Strait. We'd hoped to enjoy a batch, for which I'd read the pub is reknowned. But unfortunately they'd stopped serving them at 3:30 on a Sunday afternoon. Bass, Purple Moose Glaslyn, Deuchars & Moorhouses Blond Witch were all on, despite a few spare handpulls. York Guzzler had not long gone off. Cider was Westons Old Rosie. 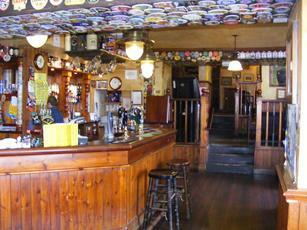 A multitude of old pumpclips on the ceiling gives a good indication to the guest beer range. The interior is fairly pleasant. It is split-level with tables on each level. Well worth a visit combined with the Boatyard just round the corner. The Eryl Mor Hotel just up the hill also dispenses an ale. 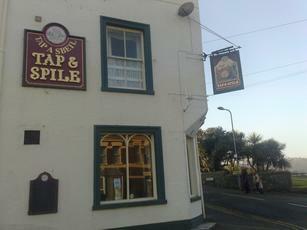 fantastic local type pub, very friendly and loads of differant beers. Food is "pub grub", but its pub grub at its best, massive portions! Do go there hungry! There are rooms to rent that are comfy and quiet, with a telly and tea/coffee making facilities. Clean and cheap! Lovely area. Highly recommended! Good place with a friendly dog, Nice view of the harbour....pleasent way to while away and evening. The second room, 7, is on the second floor, there are two staircases to the second floor, one is private and nether signposted, but you�ll get a right mouth full if you pick the private staircase. There is no central heating or on-suits or breakfast, but they do have cheap decor. Trying to settle the bill is another story. Tap & Spile have no idea of customer satisfaction or how to run a business; John Cleese would do a better job. Never again.